Craig Whyte is planning to increase the amount of money he gives to the next Rangers manager Ally McCoist, if he can seal a deal to buy the Glasgow club. BBC Scotland has learned that Whyte has listened to appeals by the club's chairman Alastair Johnston to provide more than £5m in his first season. "Craig wants that as much cash as possible to go into the club," a source close to the deal told BBC Scotland. "That's been his goal, and one reason why the deal is taking so long." The Scottish businessman has been in negotiations to buy Rangers since mid-November, with several target dates for a completed takeover having come and gone. BBC Scotland has learned that any deal is unlikely to go through until the middle of next week. 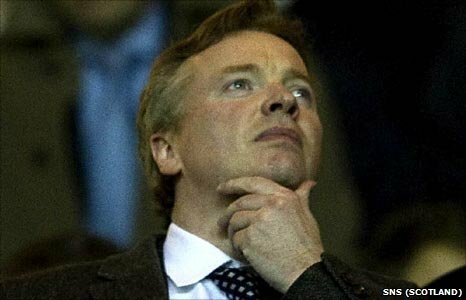 One of Whyte's promises was to provide £25m over five seasons towards strengthening the playing squad. But the source close to the deal close told BBC Scotland that the businessman has decided to make available "significantly more" than the average sum of £5m to McCoist when he succeeds current manager Walter Smith at the start of next term. "Craig is determined to get the right deal for Rangers, for the manager, for the club, and the players. "He also wants to make sure it is the right deal for the Rangers fans." The Ibrox club's current owner Sir David Murray and the Scottish businessman have been involved in months of negotiations. Chairman Johnston has insisted progress has been made, although no agreement has yet been reached. Rangers's debts currently run at £29m, most of which is believed to be owed to Lloyds Banking Group plc. Due to continued financial restrictions imposed upon the present regime, current manager Smith has largely had to make do with loan signings and free agents.